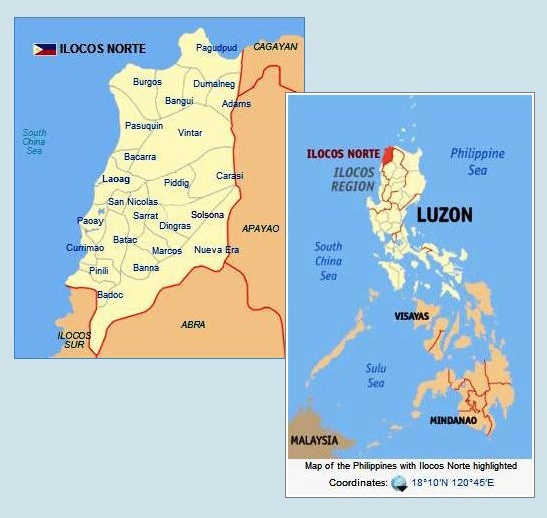 Geographical Location: A land area of 3,622.91 sq km, bordered by Ilocos Sur (south), Abra (southeast), Cagayan (east) and the South China Sea (west). Suggested Clothing: Lightweight, protective garment for the rainy months and a thin sweater for the cooler months. Tricycles and calesas are easy, safe and inexpensive ways to get around Laoag. Walking is advisable around downtown Laoag. To and from Laoag, you may take a jeepney, mini bus, or bus at designated terminals or pick-up points. Jeepney and van rentals are also available. Nagbacalan Loom Weavers Multi-Purpose Cooperative Inc.
been to the Ilocandia many times but is scenery never stops amusing me. I am proud to be an ILOCANO by blood. Agbiag dagiti ilokano. Oh, thanks, Sharleen! Villa del Mar Ivory, Saud Resort, Arinaya. Terra Rika and Apo Idon and Kingfisher are pretty close to the beach. Evangeline and Apo Idon’s (restos) are extended, facing the beach. hi! i’m so glad i found this site! truly helpful for our planned trip to vigan and laoag next week. will definitely be checking on your site from time to time just in case we would find ourselves at a loss as to what to do and where to go. Hi Ma’am, if you have time please update our website to http://www.balaydablas-laoag.com. it’s been updated. thanks, Jingle. BRGY.#55-B SALET, GEN. SEGUNDO AVE.
hello po, can u pls suggest a bus line that can bring us to manila and back here in ilocos?ung pwedeng irent.. roundtrip po.thanks! i think pwede lahat like Maria de Leon, Farinas, Florida or RCJ. Canvass ka na lang, Lala. Hope you make a good deal. Pwede din mini bus like Laforga or Rondall trans if you’re about 30 lang para cozy. hi..i chanced upon your blog while searching for a place to buy sand boarding equipment. reading through, i was surprised to see our small business establishment listed in your places to eat and buy pasalubong. thank you for the endorsement 🙂 More power! Hi. Thank you for this site. My family and I are planning to have our first ever vacation in Pagudpud. This will surely be of help. planning on a trip to pagudpud (blue lagoon) this june, but we are on a limited budget… just family with 5 members adults/kids… any suggestions? there are a number of homestays in the Blue Lagoon area. i’ll try to post something about homestays in the area before the Holy Week. Hi there! What can you recommend for a family of 4 (2 kids both 5 years of age)? We are planning a day trip to Pagudpud. We previously stayed at Saud. I would like to explore the Blue Lagoon area this time. in the Blue Lagoon area, i usually stay at the KApuluan Vista Resort, the CAsa Comsuelo homestay and I’ve tried the new The Cabanas homestay, but I find the first two more suitable for a family with little ones. there’s a big resort in front of the Blue Lagoon if you want something nearer the swim area and if you you prefer more than a quiet beach vacation. i suggest you book early ‘coz it’s difficult to book in the summer. Hi. i find your posts helpful. we are travelling to laoag on march 31 for a five day trip. I wanna know how many hours do we alot for sand dunes plus the surfing? Thanks a lot! The sand adventure in la Paz is normally one hour, so plus 10 minutes travel time from Laoag and another 10 mins going back to Laoag. Thanks! Hi, I would like to thank you for your blog as it is very informative. I will be going to Pagudpud on April 5 together with my family. As I will be leaving (driving) Manila to Pagudpud by (6pm) on April 5, do you have any recommendation on where I could have a “power nap” (2-3 hrs sleep) in Vigan or Laoag before we proceed with our scheduled Laoag Sand Dunes Tour? I will be needing the nap as we will be touring Laoag before proceeding to Pagudpud. Thanks very much. if you don’t mind staying at an inn, there’s Kingscourt along the highway going to Pagudpud, just about 5 mins away from the Laoag centro. There are good downtown hotels in Laoag like Hotel Tiffany which has a diner below, Renzo Hotel near the Johnson’s Mart ad Isabel Suites. Thanks, Philip! Very informative page, kudos to the owner! Hi, Penny! Here’s my suggestion. I’d prefer to do Pagudpud last coz it’d be the most demanding and needs one whole day. 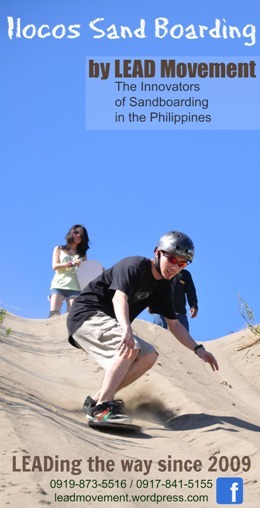 Is it true that sand boarding is better in the PM, say 5pm? yes, when the sun is low. Hi again..Thanks for this itinerary, but can you please insert these places, too? deb, both vigan and laoag are okay, but you will be needing more time to explore laoag since the must-sees in norte are not all in just laoag, so i guess laoag is the more convenient base. Hi, D! Can you pls call/text Reny of LEAD Movement @ this numbers: 0919-873-5516 ; 0917-841-5155 He can help you with details, free of charge:) He’s the hubby and pls tell him you were referred by me. He has the numbers of the van rentals owner, also a good friend and member of LEAD. Thanks! Hi, do you have contacts for Casa Teofila Lodge? hello,were planning to go in ilocos on november,we will be staying at balay da blas pension house,can you give us an iterinary because we want to see all the tourist spots in laoag,vigan and pagudpod,thank you and God bless you! hi, lorna? how many days? hello,about 3 days and 2 nights. In Laoag, try to visit the Museo Iloco, if you’re goin’ to Vigan from Laoag, You might as well go early, walk around Calle Crisolo, take photos at the St. Paul Cathedral, Crisologo and Syquia Mansions, eat at Grandpa’s Inn (Kusina Feliciras or Uno Grille) or Cafe Leona and take a calesa to go to the loomweabers, Hidden Garden, and Bantay Belltower and try to catch the 5pm cut-off at the Marcos Mausoleum in Batac. Batac empanada is a must! If you still have time visit the Malacanang of the North and Paoay Lake after checking out Paoay Church. Paugudpud should be last coz it will be hectic with all the walking you will be doing visiting Palpalokada, Kapurpurawan, Bangui Windmills, Cape Bojeador. There are many good spots in Pagudpud like Saud Cove and Blue Lagoon. Food is super at Bergblick German restaurant. On your way home, if farm experience is your thing, you may want to drop by REFMAD dragod Fruit Farm for some snacks. Btw, we are going to Saud beach on Sep 14 and 15 only, just want to ask if there are nearby places we can visit and take photographs? We really have a tight schedule and we just want to visit the beach and the wind mills. Can you suggest other places we could visit? your visit is so short!! if you want beautiful or interesting backdrop within the Pagudpud area, surely one day is not enough! You can instead take photos of food at Bergblick Deutsches Restaurant like marrungay ravioli and local seafood dishes, go for a mini trek in Balaoi for a good shot of the Blue Lagoon, shoot buko stalls/fish vendors along the highway (those are interesting to me at least) and there’s this resort with a rustic feel in Capirispisan that offers kite surfing. Try to visit Adams on your next trip to Laoag. It’s a quaint mountain town next to Pagudpud. A lot of hanging bridges and waterfalls, lovely greeeery! Wow!! this is amazing and very informative blog! Hi! We are going to Laoag via Florida Bus. Can you suggest a nearby inn where we can freshen up. Just a short period of time. 2-3 hrs maybe. Thanks. Kingscourt or get the smallest room at Hotel Tiffany or La Elliana perhaps. who is the author of this blog? what is her or his name? This is amazing and very informative blog! Good Job! “nakarating na po kami sa musoleo….husto”. maraming salamat po and more power. sana magkaroon po kau ng blog after Pagudpod area, yung papuntang Cagayan->tuguegarao area. My friend told me about the Kingscourt Hotel how come its not included in your list of place to stay? been recommending Kingscourt to tourists asking for a place to stay briefly or an inn of sorts. i’ll post once i get the contact details. Hi All, I would like to visit REFMAD farms, what is the best way to get there. Do I fly into Laoag then rent a car or take a taxi. Thanks for any help. Hi, Sebastian! There are no taxis in Laoag. Just get to the Laoag City proper and ask a tricycle driver to bring you to the Pagudpud terminal or Florida or GMW terminal and stop in front of the Burgos town hall and ride a tricycle to REFMAD. You may contact a van driver (find number in this guide) prior to your visit if you want hassle-free traveling though. hello po, can i have ms. alicia’s contacts, magtatanong lang po ako where to buy halal foods. a friend of mine is planning to visit laoag (from US) but her problem is where to find halal food for her friends who are muslims. thanks and Godbless u.
hi! I am looking for Chef Tony’s popcorn for my parents to bring home to the US…I read your blog that there is a store in Robinson Ilocos Norte. Is this correct? yes, at the food court near the ice cream stand. how happy i am to found your blog..
: from the airport is there a bus that goes directly to vigan? : do you have any idea how much is the fare going to vigan? : which place is more nice to stay in vigan or laoag? hi, Armi! the bus that goes directly to the centro of Vigan is Partas, although all buses going south like Manila pass by the rd going to the heart of Vigan. You can always take the tricycle. A little more than a hundred pesos is the fare. I’ve never stayed in Vigan. I think you can be based in Ilocos Norte, then spend a day in Vigan. The places to see in Norte are farther away each other, while you can tour Vigan’s Calle Crsologo and the rest of the herotage attractions in a day or two. Contact the Burgos tourism office at +63-77-7861408. Or call Mayor Cris Garcia: 0928-5510452, 0917-5190665 and Jonas Tesoro: 0928-5510381, 0905-3520633, 0915-5211885. A windmill farm construction project is going on around the area right now I think. thank helpful… pls could you help us make a iterinary for this : 9:00 am trvel to Vigan dn we will stay there for a night next we have a whole day and day after nxt we will plan to get back manila in the afternoon.. Im not sure if it is a good idea. it’s possible to tour Vigan and neighboring Bantay. Maybe you could take a late trip back to Manila ad save some time for the dancing fountains show at Plaza Salcedo. 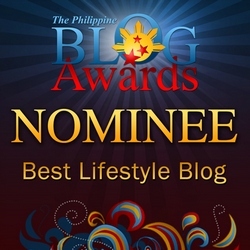 hello nice blog,, just want to ask if theres a bus Laoag to Manila ng 4pm? yes, trips are round the clock at Florida and Partas. I’m scheduled to go to Vigan and Laoag this Feb and I have already reserved a bus ride bound to Laoag. Days will fall on Monday and Tuesday. However, someone told me that some of the places to visit in Laoag are closed on Mondays. Hence, can you advise a better itinerary/plan for the said dates? I don’t know of important places in Laoag that close on Mondays. Both are good, it’s your choice. You can tour Vigan however in less than 8 hours, so you will be needing extra time for Laoag, unless you don’t intend to visit the other towns like Batac, Paoay, Burgos, etc. I’ve never visited on a Monday. Buses to Laoag from Vigan are every hour if you take Partas which is just a tricycle ride away from Calle Crisologo. You have to go before noon I guess. You can visit the Laoag market, Sinking Bell Tower and the Museo Iloco in the morning. A must in Batac is empanada, of course. There are tricycles going to Malacanang of the North. Sitio Remedios in Currimao is also a good place to visit. There’s am entrance fee for a tour only. brilliant! thank you very mch! more powers to you and your blog! nice to hear. accommodations in Pagudpud? nag-ooperate na po ba ang FLORIDA? Thank you. as of yesterday, Gino, hindi pa. passed by kasi. Thank you blauearth. do you have idea kelan ang resume? i heard 6 mos ang suspension. from Babuyan Islands, I don’t have any idea, but from Laoag, you can take Maria de Leon, Farinas and Partas. Ms. Blauearth, we already booked ticket to Laoag on April 9, 2014. How long will it take going to Claveria? 🙂 we plan to ride a Lampitaw on April 10 at 6 a.m. Are there buses na humihinto din to from laoag to Burgos-Bangui-Pagudpud?Plan ko kasi muna bisitahin ang palpakolada, Bangui windmill, and Kapurpurawan. 🙂 Thank you so much! pagudpud to claveria is about an hour. yes, buses usually stop at those places and puede hire tricycle from any point. Thank you! This blog is really helpful. any suggestions where to stay so we can tour to La Paz Sand Dunes and Bangui Windmills? I’ll get in touch with you through email. just got back from a trip, Thanks Madel! Please check your email, Madel. My hubby, a buddy and I is planning to go in Ilocos this June. Help me for a 2days itinerary. I know it is quite short but surely we can still enjoy the moment. Please include the bangui mills and some historical heritage. Thank you. HI miss blauearth! Can you please recommend a one day transportation rental for two to pagudpud , bangui windmills & other nearby tourist spots? Thanks ahead! hi, Melissa. please check the Ilocos Norte Travel Guide. The number of Totsie Leano is there. I love your blog Ma’am! ❤ 😀 and so are your photos. I am also from Ilocos Norte and I was once dreaming to create a blog like this to feature our province but since Im only a mere student, i cant afford to travel on my own yet 😀 haha more power BlauEarth.com! it is never too late to start one, Katelene:) thanks for the love! i would like to suggest LC REYES Hotel & Restaurant on your “where to stay” list. LC Reyes H&R is in Baruyen, Bangui, Ilocos Norte. thanks,Klein, i will check when i go north. Hi, Cristina. Will get in touch with you through email. Hi, Cristina! I can’t PM you on FB, and I dont have your addy. Anyways, if you like to take the bus, you can choose between Farinas TRans on Gov. Forbes, Florida in Cubao or on Lacson and Maria de Leon on Dapitan. The hotels I suggest in Laoag are Parklane or Tiffany Hotel along Bacarra Rd or Java Hotel if you want medyo high end. I’m sure you will love REFMAD Farms, Kapurpurawan if you like to travel to Bangui. The Paoay Church down south is also a great spot, then you may want to eat the famous empanada in Batac. 2 days or 2 weeks Carol? do you have any review about d’ coral beach resort?planning to go there next week or do you have any suggestions.beach/resort in currimao where kids can swim safe? try subli-subli, pangil resort in the western side of currimao or sitio remedios or playa tropical for something more unique. Hi. My friend and I are going to visit Ilocos. 3D2N. Is it better to stay in one hotel (Vigan) or 1 night in Laoag, and 1 night in Vigan? Thanks!!! yeah get to know both so it’s better to experience both. Hi, Alfonso! It would be too tiring to make it all in one day, but I guess you can do it, and make sure to be at the first destination early in the morning to be able to catch sunset at the last point. Vigan to Bangui is approximately 3 hours, which makes Paoay a good pit stop as there good restaurants around the church. there’s a lot to explore Shara. will email you later. Thank you blauearth, i have already receive your email today. Calesa or tricycle rides are fine Jemellee if you need to go to places like Bantay Bell Tower, Baluarte, Marsha’s, etc. Calle Crisologo, Plaza Burgos, Vigan Cathedral are walkable if your hotel is within the center of Vigan. Love the review. Lots of information. I would really appreciate it if you can help us plan our trip this december 26-30. Our plan is to stay for 2 nights in pagudpud, 1 night in laoag and 1 night in vigan. The problem is all the accomodations we wanted to stay in pagudpud are booked. If we will not be able to stay in pagudpud is there a place in bangui or burgos you can recommend or just make laoag our base? I have a 4 year old boy and a pool would be nice during our stay if we are not near the beach. Sorry, I wasn’t able to help. Just checked in my blog. Hope you had a great visit! Kindly help us for our itinerary. 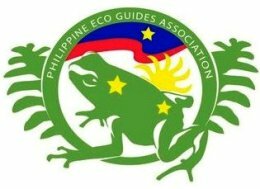 We’ll be in ilocos this April 5, arriving around 6am, via fariñas trans, laoag route. Since we already have a villa reservation in Santiago, this April 5, which place is better to let us drop off, laoag or vigan, to start some tour around since check in time in villa is 2pm? We’re planning to have vigan, laoag, pagudpud tour. Help us to have a good itinerary for this trip. We’re staying in ilocos for 4-5 days. Lookin’ forward and many thanks ahead. Vigan is a good place to start. You can use your 1st morning straight from the bus touring Vigan, coz you don’t really need more than a day to tour the city, then on your way to Laoag on presumably the second or third day, I don’t know coz you didn’t mention where you’re goin’ to be billeted on day 2, day 3, and so on, you can visit Badoc Island (optional) and the musts — Sitio Remedios in Currimao, Paoay Church, Batac, Malacanang of the North and Paoay Lake, Fort Ilocandia (optional); and in Laoag — the Laoag Sand Dunes, the original site for off-roading/sand boarding, have a gastro adventure (you can refer in my my post, the 10 best places to eat in Ilocos Norte), visit the Laoag Sinking Belltower and Cathedral. Maybe you’d like to check out the Sarrat Church, but it can be out of the way. On your way to Pagudpud, buy the famous Pasuquin biscocho in Pasuquin Bakery, drop by Refmad dragon fruit farm, then Kapurpurawan Rock Formation and Cape Bojeador in Burgos, then the windmills of Bangui. In Pagudpud, you didn’t mention where you’d be staying, so it’s tricky. The good places to eat in Pagudpud are scattered. There’s Evangeline’s in Saud, Bergblick in Burayoc, which is not too far, and SEAs Kitchen. So budget is important when choosing a place to eat in Pagudpud. Lots of good palutuan in Blue Lagoon. Especially love Yolly’s. Don’t forget the Patapat Viaduct. If you have time, you can also make Adams a day tour coz it’s near Pagudpud. You can actually reserve 2 days for Northern Ilocos Norte coz there’s so much to see. Hope I gave you a good tapered IT. I’m a student in the nearby province of Cagayan and would love to visit Ilocos. Any tipid sites kasi budget vacation namin! Tourist spots are almost on the tipid side — you will have to make wise choices though for food and transpo like taking the bus and tricycle which is available even in towns where the attractions are like to Kapurpurawan or Cape Bojeador or to Blue Lagoon from the highway.